The Mac has built-in support for zipping and unzipping files. You can simply double-click a zipped file to expand it, or select multiple files and compress them, all from the Finder. There are no apps to launch, or so it seems. But behind the scenes, Apple's Archive Utility is hard at work, carrying out the compression or expansion of files, as required. It's nice to have such an easy-to-use compression tool integrated into the Mac, but you may not know that there are a handful of options you can configure for Archive Utility that may meet your needs better than the defaults Apple has set up. The Finder uses the Archive Utility to perform compression (archiving) and expansion of files. However, the defaults the Finder uses are hard-wired; you can't make changes to them. For example, the Finder will always use the ZIP format and will always save archives in the same folder as the original. When you want a bit more control over the archive format, what happens to the original files, or where expanded or compressed files are stored, you can use the Archive Utility directly. The Archive Utility is pretty basic, but it can handle quite a few file formats for expansion, and three popular file formats for compression. When you find Archive Utility, double-click the app to open it. Archive Utility will open without presenting a window; instead, there's just a set of menus that contain three important items. In the File menu, you'll find the Create Archive and Expand Archive options. These two commands will work on the files and folders you select in any Finder window. The other important menu item, the one we're going to spend the most time on, is in the Archive Utility menu and is called preferences. To open Archive Utility's preferences, click the Archive Utility menu and select Preferences. The Archive Utility Preferences window is broken into two sections. The upper section contains options for expanding files; the lower section contains options for compressing them. Save Expanded Files: You can select where you want to store expanded files on your Mac. The default location is the same folder that holds the archived file you're expanding. To change the destination for all file expansions, click the Save expanded files drop-down menu and select into. Navigate to the folder on your Mac that you want to use as the destination for all expanded files. After Expanding: You can also control what should happen with the original archive file after the files it contains are expanded. The default action is to leave the archive file in its current location. You can use the After expanding the drop-down menu to instead move the archive file to the trash, delete the archive, or move the archive file to a folder of your choice. If you choose the last option, you'll be asked to navigate to the target folder. Remember, this folder will be used as the target location for all archived files that you expand. You can change your selections at any time, but it's usually simpler to select one location and stick to it. Reveal Expanded Item(s) in Finder: When checked, this option will cause the Finder to highlight the files you have expanded. This can be handy when the files in an archive don't have the names you were expecting, or at least names that are similar to what you were expecting. Keep Expanding if Possible: This box is checked by default and tells the Archive Utility to keep expanding items it finds within the archive. This is helpful when an archive contains other archives. Save Archive: This drop-down menu controls where the archive file is stored after the selected files are compressed. The default is to create the archive file in the same folder where the selected files are located. You can also select the Into option to pick a destination folder to be used for all created archives. Archive Format: The Archive Utility supports three compression formats. Compressed archive, which is the same as a UNIX compression method called cpgz. Regular archive, also known in the UNIX world as cpio. This method actually doesn't perform any type of compression; instead, it just creates a container file made up of all of the selected files. ZIP is the final option, and the one most Mac users are familiar with. This is the standard ZIP format that has been used on Macs and Windows PCs for years. After Archiving: Once you finish archiving files, you have some options for what to do with the original files. You can leave the files alone, which is the default option; move the files to the trash; delete the files, or move the files to a folder of your choice. Reveal Archive in Finder: When checked, this box will cause the archive file to be highlighted in the current Finder window. By using the above options, you can control how files are compressed and expanded when you manually use the Archive Utility. Finder-based compression and expansion will always use the same default options, no matter how you set the preferences here. 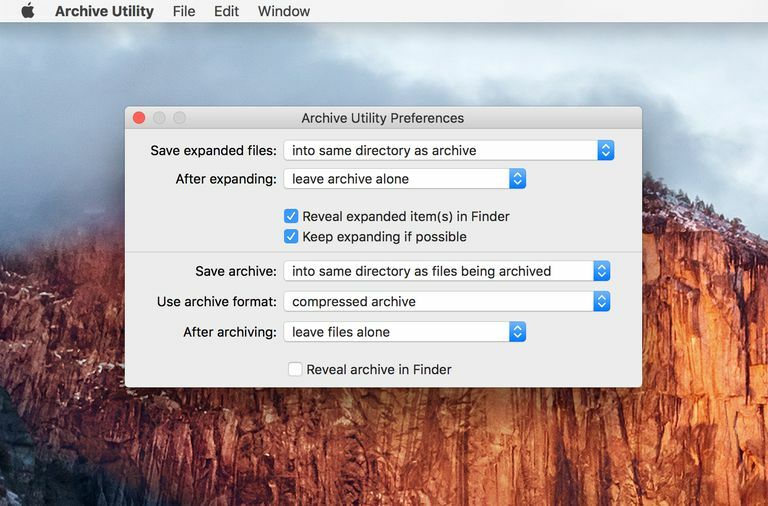 These preferences only apply when you launch the Archive Utility and use the Create Archive and Expand Archives commands found in the app's File menu. To use the Archive Utility, launch the app, if it's not already open. Select File > Create Archive. A window will open that you can use to navigate to the folder that contains the items you wish to compress. Make your selection, and then click the Archive button. Select File > Expand Archive. A window will open that you can use to navigate to the folder that contains the archive you wish to expand. Make your selection, and then click the Expand button.